A nowcast, at its simplest terms, is a description of present weather conditions and those immediately expected. Unlike a forecast, it is more about what is currently being observed, either via eye witness or through remote sensing, than what will happen at some point in the future. Remote sensing is collecting real-time information about the Earth via a remote source. That source, as it relates to meteorology, is most usually either weather radar, weather satellite or a weather station. Today, with the use of high-speed mobile wireless technology, we have the ability to collect remote sensing data from all public (and some private) sources while we are in-motion. Prior to this technology, it was necessary to stop and find an available WiFi signal, or even before that, use a payphone to call a person who was designated to nowcast for a specific tour. 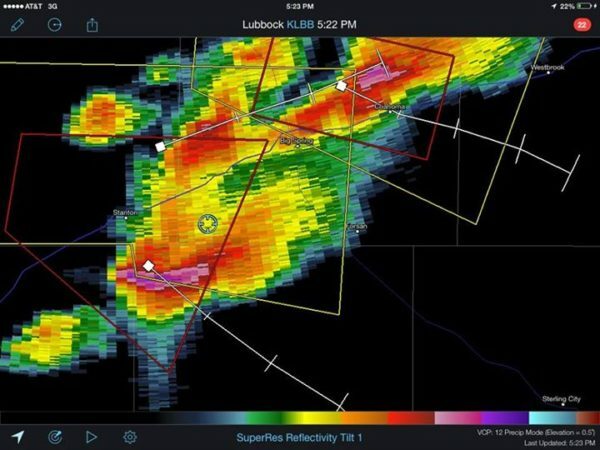 Let’s discuss some of the nowcasting technology and tools that we have and explain how we use them during the storm chasing tours. The USA has the most advanced weather surveillance radar network in the world. The current infrastructure was rolled out in the 1990s and has undergone several upgrades since. Today, our radar network has “Super Resolution” and are dual-polarized. Pertaining to the resolution, it’s only good as the software that is being used to examine the data. We have also written a short article that discusses the storm chasing technology that we use during our storm chasing tours. There are two different types of data feeds that are disseminated: Level 2 Data and Level 3 Data. Both are acceptable for storm chasing, however, Level 2 Data has much higher resolution than Level 3 Data. The disadvantage of Level 2 data is that, since it’s higher resolution, it’s also a bigger data file and therefore it takes a little longer to get from the radar to the end-user. We actually use both types of data feeds during our tours either at the same time, or at different times, depending on the conditions. Level 3 data provides us with an almost real-time image from the output of the actual radar. It may take a minute or two longer (which when storm chasing can seem like an hour) for the Level 2 data to arrive to the end-user. If we’re in a situation where we need to know exactly what the radar is sensing immediately, then we’ll be using Level 3 data. However, most of the time we’ll use Level 2 data because it’s likely we’re already at or under the storm and can see it with our eyes, which are a much more useful tool than radar anyway. The radar does, however, provide us with useful info while we’re situated in a storm’s environment, such as any developing hail cores or velocity couplets. One of the most useful tools available to nowcasters is satellite imagery. Weather satellites have many remote sensing instruments allowing forecasters to view the Earth through different wavelengths in near real-time, such as infrared, or when viewing only water vapor. The most useful wavelength, however, is visible light (essentially, it’s a video camera in orbit). Through the use of satellite imagery, we can identify various boundaries, such as cold fronts or outflow boundaries from previous storms. We can identify cumulus fields, which are areas where thunderstorms are likely to happen, and we can see when those cumulus fields initiate into thunderstorms. There are weather stations installed all over the globe and most of them are part of a bigger network that report the conditions at their locations, which are then logged into a database and available via the Internet to the public. These weather stations are extremely useful in the forecasting and nowcasting of any weather. We are constantly looking at surface maps showing weather information and customers ask a lot: “What do all those little numbers and pointy things mean?” So, let’s talk about it for a minute. Each plot, called a METAR (Meteorological Terminal Air Report), from a weather station contains a lot of information that is important to us. First, the most important piece of information on any weather map or chart is the time! It’s an easy piece of information to overlook, so it’s best to just get into the habit of looking at the timestamp first to make sure it’s current! Second, there are two very important numbers listed on the left side of the plot. The top number is the air temperature (T), and the bottom number is the dewpoint temperature (Td). Depending on the locale, these numbers may be in either Celsius or Fahrenheit, but the (T) will always be listed above the (Td). The (T) is always written first, so if a person was reading the plot shown here, they would say the current conditions at this station are 57 over 56 degrees, meaning the temperature is 57 degrees with a dewpoint of 56 degrees. Either between these two numbers or in their immediately vicinity there might be a weather symbol. These symbols indicate such things as fog, snow, rain, thunderstorms and many other weather related events. Pertaining to storm chasing, they’re really not that important. It’s much more important (at least to this author) to know the (T) and the (Td) along with the wind information. Wind is expressed in both direction and speed with a simple arrow. In the plot here, the wind is blowing from the north to the south. It easiest to remember the wind direction by thinking of a typical “arrow” that would be fired from a bow. The back of the arrow has feathers and the back of a station plot has wind barbs. The arrow travels in the direction of the arrowhead and the wind travels in the direction of the wind arrow. Wind speed is expressed by the “barbs” on the back of the “arrow”. A short barb is a 5 knot wind, a long barb is a 10 knot wind. So, in the plot here, the wind speed is 15 knots. There may also be other useful wind info, which is not shown here, to indicate wind gust. If you had a 15 knot wind that was gusting to 23 knots, the plot would show a half and a full barb, along with “G23” written next to the plot. Sea-Level pressure is also expressed on the plot to the right. It should be noted that on a surface map containing several hundred or thousand stations, that only a small percentage of them will typically report sea-level pressure. These are the main nowcasting tools that we use while storm chasing. We acquire data from a variety of different sources, much of it being available to the public. We do however maintain our own private weather server that is ingesting weather data 24-hours a day, 7-days a week and processing only the data that is of the most use to us for our specific purposes. This information is processed specifically to our needs and is only available to our team. However, there are a lot of websites that provide satellite imagery and weather station plots, so feel free to dive in and learn as much as possible. If you’re looking for the latest in weather radar data, we recommend RadarScope which is available for all iOS devices as well as Android, and there is a Mac Desktop version as well. To continue your learning experience, sign-up for a storm chasing tour and learn from our expert storm chasers in-person while chasing storms across Tornado Alley! To get started, simply make a reservation after choosing our tour from our storm chasing tour schedule.